What is the World Treaty Index? The World Treaty Index (WTI), originally compiled by Peter Rohn in the 1960s and 1970s and subsequently maintained and updated at the University of Washington, is a comprehensive list of all known treaties formed during the twentieth century. This includes not only treaties formally registered with the United Nations (UNTS) but a significant number of unregistered agreements. What information does the World Treaty Index provide? Who is currently administrating the World Treaty Index? The Electronic WTI is now housed at the University of Michigan and administrated by Michael Bommarito, Daniel Martin Katz and Paul Poast. We are highlighting the newly constructedBeta Prerelease of the WTI website in an effort to obtain feedback prior to the official release. The currently available product provides access to information on more than 58,000bilateral and multilateral treaties formed between 1900 and 1997. When full coverage for the 20th century is complete, the database should feature in excess of 70,000 agreements. What are some examples of searches I can conduct on the World Treaty Index website? While the WTI should support all browsers, we suggest using Firefox. 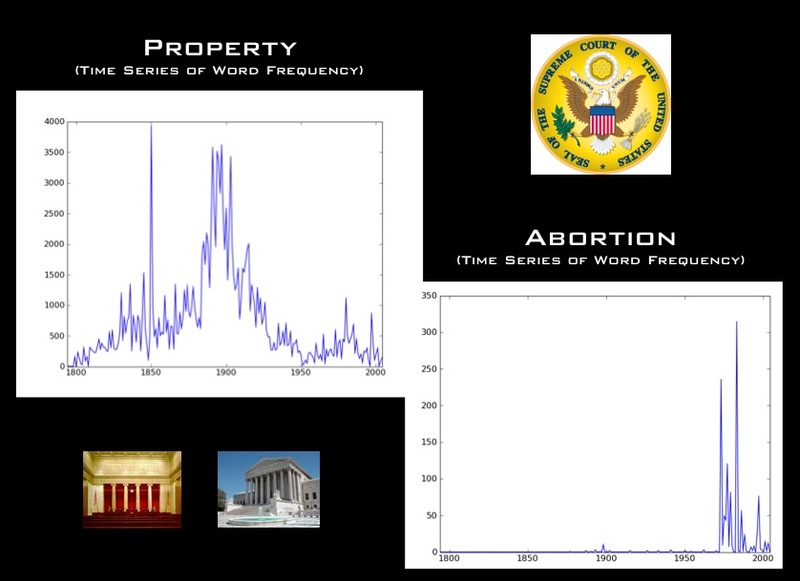 Below are three sample searches. Search #1: Suppose a user would like to collect all agreements involving Brazil. Use the “flexible search” and follow three easy steps. (A) Select the country/organization field (B) within the country/organization field set the field value = Brazil (C) click the search button. Search #2: Suppose a user would like to collect all agreements between Mexico and Spain. Use the “flexible search” and follow five easy steps. (A) Select the country/organization field (B) within the country/organization field set the field value = Mexico (C) Select a second country/organization field (B) within this new country/organization field set the field value = Spain (E) now click the search button. Search #3: Suppose a user would like to know how many extradition agreements France signed between 1950 and 1962. This is similar to the examples above but involves the topic, signed on or after and signed before or on fields. After the user chooses the proper search fields and selects the search information, the WTI will produce on the screen a list of the desired agreements and provide the option of downloading the list as a CSV file. When will it feature full coverage for the entire 20th Century? By the end of 2010, we will add (1) all bilateral treaties formed between 1900 and 1944 [Now Mostly Done] (2) all bilateral treaties formed between 1998 and 1999, and (3) all multilateral agreements and a list of all parties to each multilateral agreement. If you know of an agreement that is not ultimately featured on the site please contact us and we will be happy to add it to the list. How can I learn more about the World Treaty Index? 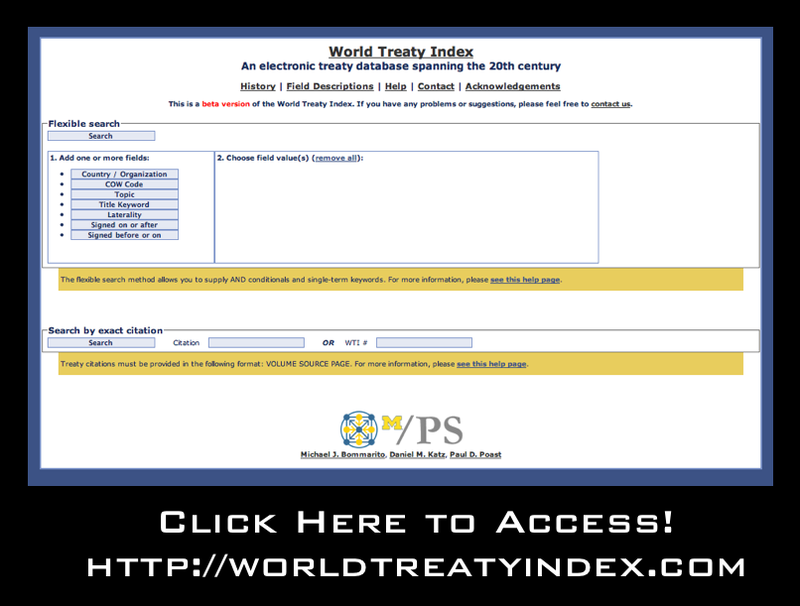 For a general history of the World Treaty Index, visit the “History Page” on the worldtreatyindex.com website. For a more detailed treatment please see: Glenda Pearson, Rohn’s World Treaty Index: Its Past and Future, 29 International Journal of Legal Information 543 (2001). 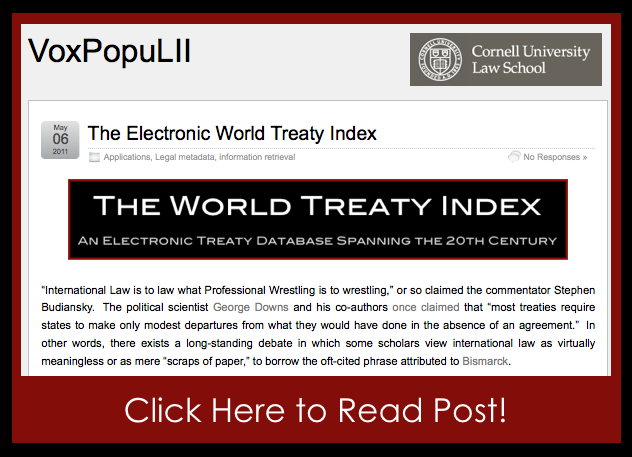 What additional extensions of the Electronic World Treaty Index are planned? As noted above, our initial goal is provide complete coverage of all known agreements in the 20th Century. Planned extensions include bringing the World Treaty forward so as to provide coverage up to 2010. In addition, we plan to collect information regarding treaty terminations. Finally, we would like to enhance the granularity of our topic codes and allow for agreements with multiple dimensions to feature multiple topic codes. At this point, we have only offered a beta pre-release of the site. Thus, we would really appreciate your feedback, etc. Please email us at worldtreatyindex@gmail.com if you have any thoughts about how to improve the site. The October 13th Edition of the Proceedings of the National Academy of Science features a very interesting article by Michael Marder and Dhruv Bansal from the University of Texas. 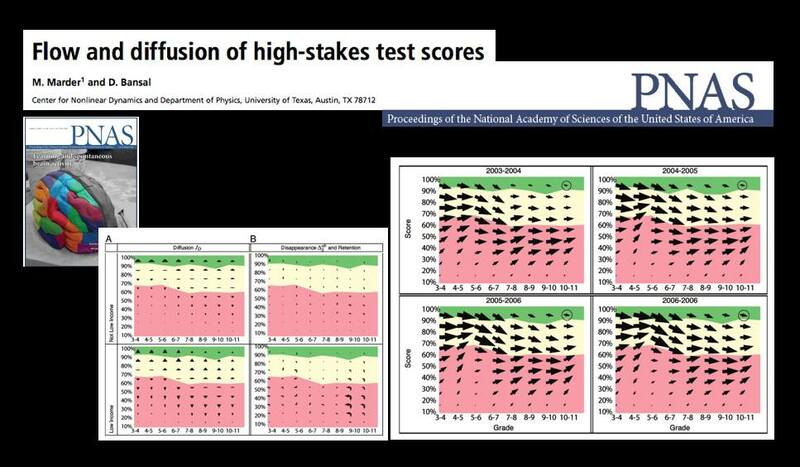 From the article … “Texas began testing almost every student in almost every public school in grades 3-11 in 2003 with the Texas Assessment of Knowledge and Skills (TAKS). Every other state in the United States administers similar tests and gathers similar data, either because of its own testing history, or because of the Elementary and Secondary Education Act of 2001 (No Child Left Behind, or NCLB). Texas mathematics scores for the years 2003 through 2007 comprise a data set involving more than 17 million examinations of over 4.6 million distinct students. Here we borrow techniques from statistical mechanics developed to describe particle ﬂows with convection and diffusion and apply them to these mathematics scores. The methods we use to display data are motivated by the desire to let the numbers speak for themselves with minimal ﬁltering by expectations or theories. 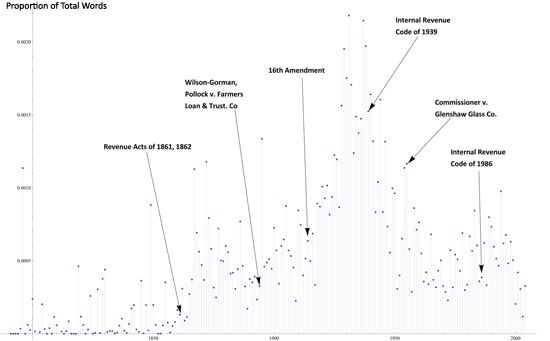 In honor of Tax Day, we’ve produced a simple time series representation of the Supreme Court and tax. 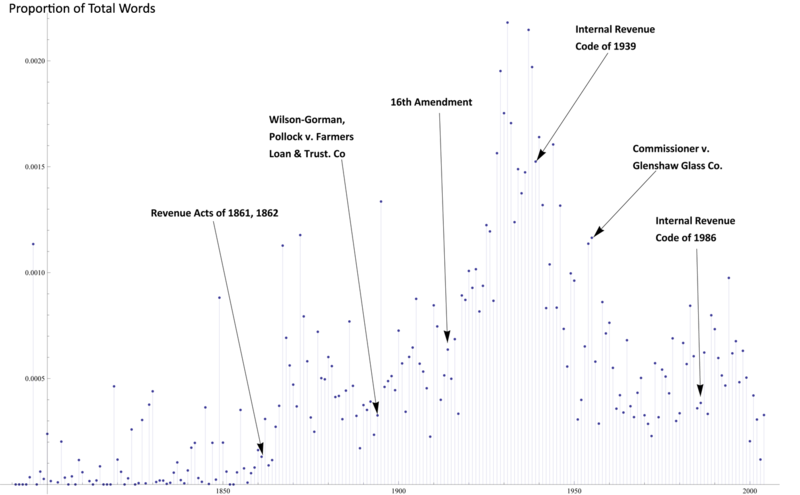 The above plot shows the how often the word “tax” occurs in the cases of the Supreme Court, for each year – that is, what proportion of all words in every case in a given year are the word “tax.” The data underneath includes non-procedural cases from 1790 to 2004. The arrows highlight important legislation and cases for income tax as well. Make sure to click through the image to view the full size. Research in the academic world suffers from the “hammer problem” – that is, the methods we use are often those that we have in our toolbox, not necessarily those that we should be using. This is especially true in computational social science, where we often attempt to directly import well-developed methods from the hard sciences. To prove the point, I’d like to highlight one example we’ve come across in our research. 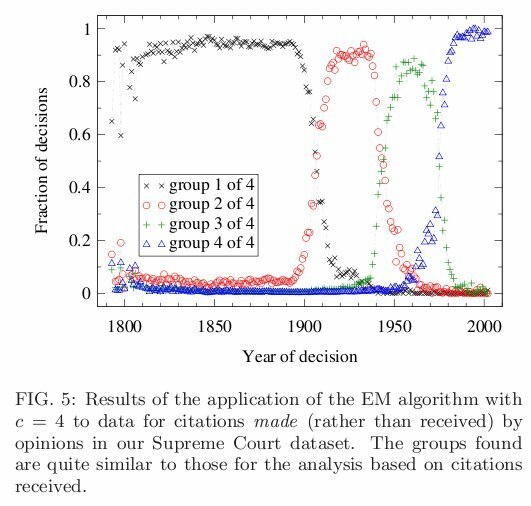 In Leicht et al’s Large-scale structure of time evolving citation networks, the authors apply two methods to a simplified representation of the United States Supreme Court citation network. Both of these methods rely on complicated statistical algorithms and require iterative non-linear system solvers. However, the results are consistent, and they detect “events” around 1900, 1940, and 1970. One first-order alternative to detecting significant “events” in the Court would be to count citations. 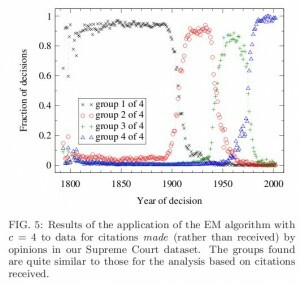 One might suspect, for instance, that the formation or destruction of law might go hand-in-hand with an acceleration or deceleration in the rate of citation. Such a method is purely conjectural, but costs much less to implement than the methods discussed above. This figure shows the number of outgoing citations per year in blue, as well as the ten-year moving average in purple. 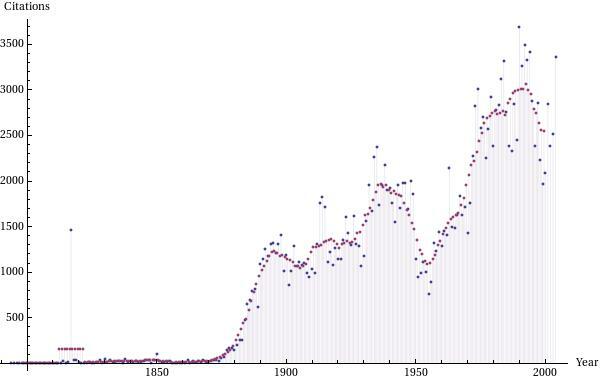 The plot shows jumps that coincide very well with the plot from Leicht, et. al. Thus, although only a first-order approximation to the underlying dynamics, this method would lead historians down a similar path with much less effort. This example, though simple, is one that really hits home for me. After a week of struggling to align interpretations and methods, this plot convinced me more than any eigenvector or Lagrangian system. Perhaps more importantly, unlike the above methods, you can explain this plot to a lay audience in a fifteen minute talk.